The Iowa-born 33rd vice president of the United States (1941-45) was FDR's second second-in-command, serving before this as Secretary of Agriculture (1933-40, the same position his father held under Harding 1921-24) and after the vice-presidency briefly as Secretary of Commerce (1945-46). Bold large signature on a heavy stock 5" X 3" card, n.p., n.y. Near fine. Typed at center near top of card is "Autograph Card / Secretary of Agriculture," which approximately dates this signature to Wallace's years in that office (1933-40). A handsome example. 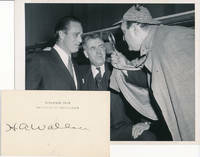 -- and accompanied by a fine and uncommon original black-and-white 8½" X 6½" glossy news agency photograph showing Wallace standing with FDR's son Elliott as comic actor Zero Mostel in Sherlock Holmes costume examines them with a magnifying glass. Original mimeographed text affixed to photo dates this image 31 March 1947 and under the headline "After Denouncing Loans to Greece and Turkey" explains: "Following their appearance before the Anti-Greek Loan Rally in Madison Square Garden last night... Henry A. Wallace (center) former Secretary of Commerce, and Elliott Roosevelt (left) son of the late president, obliged the cameraman with this bit of humorous horseplay with the expert assistance of Zero Mostel, famous clown and mimic of stage and screen, who was one of the sponsors of the affair...."
New York: Vintage Books, 1984. Paperback. Foreword by Cyrus R. Vance. 12mo. Stiff glossy wrappers. xiv, 140pp. Near fine. A tight and nice first edition of this "Council on Foreign Relations Book," inscribed and signed by this noted foreign policy analyst in black ballpoint on front flyleaf: "To Bob -- / With high esteem / & fond memories of / our travels together / on the Time News Tour. / Strobe Talbott / 7/2/84." Robert Malott (1926-2018) was a noted Chicago businessman, CEO of FMC Corporation, Republican politico and philanthropist. New Rochelle, NY: Arlington House, 1968. Hardcover. Small 4to. Pale orange cloth with black spine lettering, pictorial dust jacket. 355pp. Near fine/very good. Mild jacket edgewear. 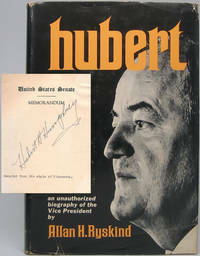 Tight and handsome first edition of this unsanctioned bio -- with choice autograph addition: Tipped to front flyleaf is a 4" X 4" printed "United States Senate Memorandum" sheet in the center of which Humphrey signs in full diagonally, exceptionally large and bold in black ink; near bottom of this slip has been typed "Senator from the state of Minnesota." By way of background, Humphrey's offices utilized the Autopen extensively throughout his lengthy career to sign an enormous array of letters, documents, photographs, etc. -- and the market is rife with these not-properly-identified nonauthentic signatures. This unusually large (4") and unquestionably authentic exemplar is thus surprisingly uncommon, and though undated likely hails from the early 1960s. Humphrey (1911-78) served as Lyndon Johnson's second in command (1965-69) as well as long-time U.S. Senator from Minnesota (1948-64, 1971-78). The wife of 31st President of the United States Herbert Hoover, he by profession a geologist and mining engineer and her a formidable scholar and linguist, served as First Lady from 1929 to 1933. Handsome full signature in brown ink on a heavy stock 3½" X 2¼" card bearing an imprinted "Stanford University, California" along the top. Near fine. Though undated, certainly from the post-presidential years when the Hoovers returned to their Stanford residence up until her death. 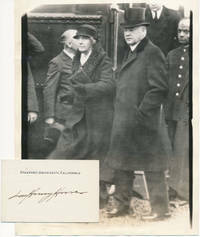 Accompanied by a superb original 6½" X 8½" news agency black and white photograph depicting the President and First Lady Hoover full length walking through a train station, with original printed caption (dated 7 January 1933) mounted on verso reading, under the headline "Arrive for Coolidge Funeral": "President and Mrs. Hoover arriving at Northampton, Mass., for the funeral of the late Calvin A. Coolidge today...." Fine. A great signature example and most unusual vintage photograph. The wife of Warren Harding's vice president (1921-23) became First Lady upon his death and her husband's swearing in as the 30th President of the United States, a role he filled from 1923 to 1929. AD (unsigned), 1p, 5¼" X 4¼", Washington, DC, postal cancellation 22 February 1926. Near fine. 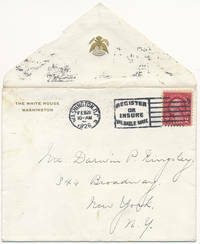 Official heavy stock White House envelope bearing red two-cent George Washington stamp at upper right, boldly addressed in Coolidge's hand large and boldl in black ink to "Mr. Darwin P. Kingsley / 346 Broadway, / New York, N.Y." at center. Kingsley (1857-1932) was a fellow Vermonter who headed up the massive New York Life Insurance Company and befriended the Coolidges. Accompanied by a printed 5" X 7½" printed book-type photograph (Harris & Ewing) of her as First Lady. 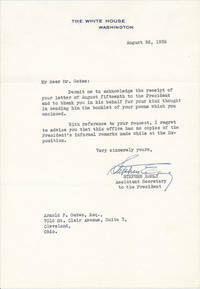 ---- Not signed by her, remember, but an interesting and unusual handwriting example as First Lady. Chapel Hill: The University of North Carolina Press, 2009. Hardcover. Small 4to. Tan cloth spine with gilt lettering and brown paper over boards, pictorial dust jacket. 373pp. Illustrations. Fine/fine. A superb, tight-as-new first edition. N.p. : N.p., n.y.. Hardcover. 8vo. Black buckram with gilt spine lettering. xix, 524pp. Illustrations. Fine. Nicely tight and attractive if bibliographically cryptic facsimile reprint of the first edition (New York: Doubleday & McClure, 1898), which Robert W. Johannsen critiqued as a "sympathetic, readable characterization." NEVINS II, 58. Undated, but modern. New York: W.W. Norton & Company, 1972. Hardcover. Introduction by Franklin D. Roosevelt Jr. Small 4to. Acqua blue cloth with gilt spine lettering, pictorial dust jacket. 368pp. Illustrations, pictorial endpapers. Near fine/very good. Faint jacket edgewear. 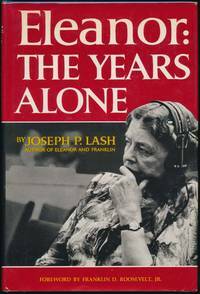 A superb, tight first edition -- and signed boldly on an inner flyleaf in blue ballpoint by this Eleanor Roosevelt confidante and Pulitzer Prize-winning biographer of her (1909-87). Kroch's & Brentano's "First Edition Circle" bookmark laid in. By SCHLESINGER, Arthur M., Jr.
Boston: Houghton Mifflin Company, 1973. Hardcover. Small 4to. 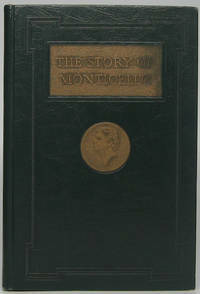 Grey cloth with gilt lettering, dust jacket. x, 505pp. Near fine/very goods. Mild jacket edgewear. 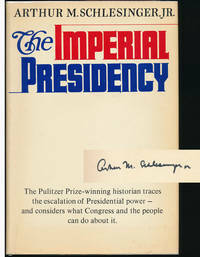 A lovely and tight first edition in which (to cite front jacket panel) "The Pulitzer Prize-winning historian traces the escalation of Presidential power -- and considers what Congress and the people can do about it." Signed boldly in full by the late historian/intellectual Schlesinger (1917-2007) in black fineline on the front flyleaf. Early was a well-rounded journalist became the longest-serving White House press secretary in history, first under Franklin D. Roosevelt (1933-45) and again briefly under Harry Truman (1950); Howe was FDR's long-time assistant and secretary, disliked at first by Eleanor for some of his earthier qualities but valued by FDR for his political savvy; and McIntyre was a journalist and "Washington Times" editor who served as one of FDR's secretaries from 1933 until his death. A superb trio of Typed Notes Signed from President Roosevelt's top three secretaries, all on White House letterhead and all addressed to future notable Lincoln and Civil War scholar Arnold F. Gates (1914-93): Early is a TNS, 1p, 6¼" X 9", Washington, DC, 26 August 1936. Near fine. "...thank you in his behalf for your kind thought in sending him the booklet of your poems.... I regret to advise you that this office has no copies of the President's informal remarks made while at the Exposition." Large and bold signature in blue ink. Howe is a TNS, 1p, 6¼" X 9", Washington, DC, 23 November 1934. Near fine. Tells this admirer that "I have received your recent card and... have pleasure in sending you herewith several of the President's addresses." Large, bold full signature in blue ink. 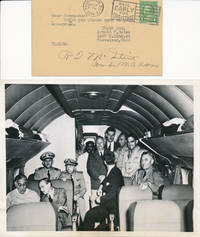 McIntyre is a TNS, 1p, 6¼" X 9", Washington, DC, 13 November 1936. Near fine. "I am sending you under separate cover copies of the President's addresses which we have available." Another large and bold signature in blue ink. The eldest of President Hoover's children was likewise an engineer and politician; his many business dealings gave him experience dealing with foreign nations, which came to President Eisenhower's attention, and he became his Under Secretary of State from 1954 to 1957 under John Foster Dulles. TLS, 1p, 8" X 10½", Washington, DC, 21 December 1956. Addressed to Gordon B. Carson. Very good. Faint original folds; single staple hole at upper left. 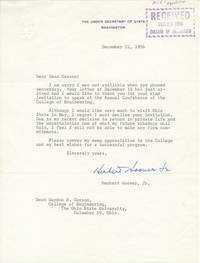 On imprinted "The Under Secretary of State" letterhead, Hoover writes to the dean of Ohio State University's College of Engineering, declining to speak at the annual conference of the College of Engineering. In part: "Due to my recent decision to return to private life and the uncertainties now of what my future schedule will hold, I feel I will not be able to make any firm commitments...." Boldly signed in full in bright blue ink. New York: W.W. Norton & Company, n.y.. Paperback. Small 8vo. Stiff glossy pictorial wrappers. viii, 216pp. Near fine. A tight and handsome later (5th) printing of this 1973 study, a volume in editor Harold M. Hyman's "Nort Essays in American History" series. Old Tappan, NJ: Fleming H. Revell Company, 1979. Hardcover. Small 4to. Blue cloth spine with gilt lettering and blue paper over boards, pictorial dust jacket. 400pp. Illustrations. Near fine/very good. Faint jacket edgewear. Tight, attractive first edition. By von HOLST, Hermann E.
New York: Chelsea House Publishers, 1980. Paperback. Introduction by Clyde N. Wilson. 8vo. Stiff glossy pictorial wrappers. xxxiv, 374pp. Frontispiece. Near fine. 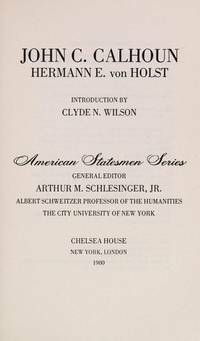 A tight and handsome facsimile reprint of the 1899 first edition of this "American Statesmen Series" volume, with new introduction by general series editor Arthur M. Schlesinger Jr.
New York: Doubleday & Company, 1962. Hardcover. Small 4to. Grey cloth with gilt lettering, pictorial dust jacket. xvi, 460pp. Near fine/very good. Jacket lightly edgeworn, with couple of archivally closed (on verso) small edge tears. Tight, quite nice first edition, bearing the usual black ink Autopen signature of Nixon on an inner flyleaf. An exceptionally clean, handsome copy -- signature NOT authentic, remember. By RHODES, Thomas L., and LORD, Frank B.
Baltimore: The Pridemark Press, 1947. Hardcover. 8vo. Dark green blind-ruled leatherette with raised gilt lettering and medallion. 94pp. Frontispiece, numerous illustrations. Near fine. A tight and handsome first edition of this study and tribute to Thomas Jefferson's plantation home outside Charlottesville, Virginia -- and with fine and appropriate autograph addition: Tipped before the half-title page is a special heavy sheet signed large and bold in black fineline by famed Jefferson scholar Dumas Malone (1892-1986), author of the Pulitzer Prize-winning six-volume "Jefferson and His Time" (1948-81). New York: Harcourt Brace Jovanovich, 1975. Hardcover. Small 4to. Tan cloth spine with red and blue lettering and blue paper over boards, dust jacket. xi, 212pp. Near fine/very good. Faint jacket edgewear. A tight and nice first edition of this chronicle of Gerald R. Ford's first 100 days in the Oval Office. Chicago: Civil War Round Table, 1950. Paperback. Small 4to. Limp black cloth spine and stiff grey wrappers. 65pp (rectos only). Very good. Outer wrappers (only) a bit age toned and lightly soiled, with couple of small edge chips. 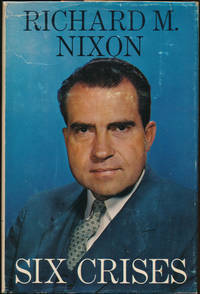 First edition, tight and decent. Publication No. 4 of the famed Chicago branch (the first in the country) of the Civil War Round Table, limited to 300 copies -- this copy signed by Dalgety on the title page in blue ballpoint. 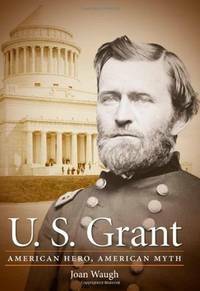 An unusual study of the writings of every president between George Washington and James Buchanan on the subject of civil war. 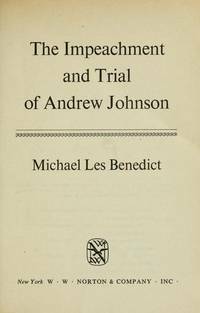 A rather homespun production, typed and mimeographed -- and definitely uncommon. New York: Parents' Magazine Press, 1965. Hardcover. 4to. Pictorial cloth, pictorial price-clipped dust jacket. xv, 224pp. Extensive color illustrations, pictorial endpapers. Very good/very good. Jacket mildly edgeworn and a bit rubbed. A tight and quite nice reprint edition of this fun and popular collection, superbly illustrated.